Cats Vs. Cancer is as easy as it gets…. Watch Cat Videos, Fight Cancer. During the months of November and December My Hope Chest will be focusing on LAUGHTER as the Best medicine (isn’t it always) and sharing funny kitty videos for your enjoyment. That’s not all… the more you watch, we raise money. How does that happen? Crazy but true, just read and learn. Cats vs Cancer is a non-profit site, run entirely by volunteers, built to help those battling cancer. Each month they take money raised through ads sold on the site, as well as your donations, and give that to a cancer charity. Our mission is to be the most entertaining and fun charity on the planet. They do this by curating the most hilarious, adorable, and captivating cat-things from around the web for your enjoyment and viewing pleasure. Take a step back in time to the elegant Crystal Ballroom at the historic Ft Harrison Hotel that has been restored to its original grandeur. 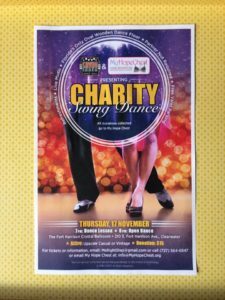 A monthly swing dance fundraiser for charity, November will benefit My Hope Chest! 7:45-10:00 Dance to swing favorites by the Flag Band. RSVP required up to two days prior. Cash or check payable to charity. Parking: Free street parking after 6. Attire: Dressy casual to vintage elegant. 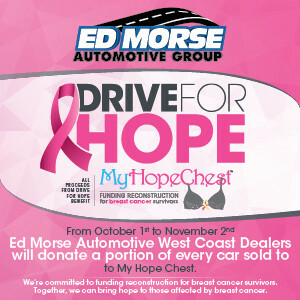 Through November 2, Ed Morse Automotive Group is supporting My Hope Chest by donating a portion of every car sold to the nonprofit organization. Their “Drive For Hope” campaing began October 1 in honor of Breast Cancer ACTION month. “Ed Morse Automotive Group – West Coast, FL, Operations… We are humbled to participate, in some small way, knowing we are taking ACTION on behalf of the well-being and completeness of breast cancer survivors. The MY HOPE CHEST organization along with our DRIVE FOR HOPE campaign is doing good things and that’s a good thing, ” said Anita Evans Marketing Director, Ed Morse Automotive Group West Coast. Ed Morse has been selling and leasing for less while providing excellent customer service for over 65 years. Headquartered in Delray Beach, Florida, this family owned and operated company presently has 9 Brands, 17 franchises, and 15 locations from which to choose. Find out more at www.EdMorse.com. Hope Floats at the Chattaway! Join our friends hosting this fundraiser at the famous St. Petersburg landmark, The Chattaway! The evening’s event will include a dinner and a little varity show with music from the past outback under the stars in the courtyard! (Event planner Winona Kitto and My Hope Chest Founder Alisa were former professional dancers together). For those who are already long time fans of the Chattaway, this is sure to be another wonderful experience. Visit them on Facebook at The Chattaway. Price Includes a 3 course organic fare with outside dining in their lovely courtyard. Use the form below to purchase your tickets! For more information please contact Wynona Kitto at Chattaway 727-823-1594. At the Sloppy Pelican on St. Pete Beach. Last call for summer fun… Come join us as the Tampa Bay Beaches Chamber of Commerce kicks off its 2nd event on the water at the Sloppy Pelican! An all afternoon affair with bands, para-sailing and more benefiting My Hope Chest and breast reconstruction for the uninsured breast cancer survivor. 15 Great packages with restaurant certificates, Permanent makeup artist package, Southern Wine & Spirits package, Sloppy Pelican package, Surf Shack package & more. Come hear favorites Liz Adams followed by the John Ellis Group, then Ho Daddy’s closes out the night. There will be FREE para-sailing with donations going to My Hope Chest and a big beautiful boat out back with music,drinks and fun!!! Sloppy Pelican will donate 10% of proceeds to MHC. Bring friends and come out and enjoy the day and support our cause. Please RSVP on Facebook and SHARE the event with your Friends! Join us for great laughs with the amazing comedian John Heffron, winner of the 2nd season of NBC’s Last Comic Standing and finalist in the subsequent season! $25 includes a cocktail, and a raffle of great prizes will add to the charity event. This is the first in a series of comedy events for MHC resurrecting the main event previously held at the Palms Hotel in Las Vegas… Laughter is after all, the best medicine!